Universal Desk / Kitchen / Cupboard / Shelf Metal Clamp with Full Rotation for 7-15.0 inches Tablets : allputer.com - Accessories for all your Portable Electronics & Computers! This mount allows you to mount your iPad / Tablet firmly to cupboard, shelf, desk or any board. You can even apply this mount to your car dashboard for navigating while driving. - Suitable for Wide Ranges of Tablets, from 7.0" Galaxy Tab 7.0' to iPad Mini to iPad Air to iPad Pro 12.9"... and a 15.0" Tablet! 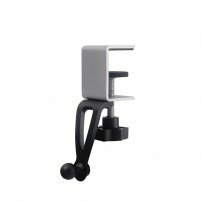 - Secure Tablet Clamp and Easy installation: A rubber suction cup clamp, keep your tablet firmly tighten in the mount. Equipped with an extra silicone pad, prevent your furniture against damage, easy nstallation, no tools required, just applied it to the place you want and tighten it up. - A safe and stabe solution to hold your iPad. - Case Compatible, you can have your thin cover on, no need to take off. - Some Models may just allow landscape mode.